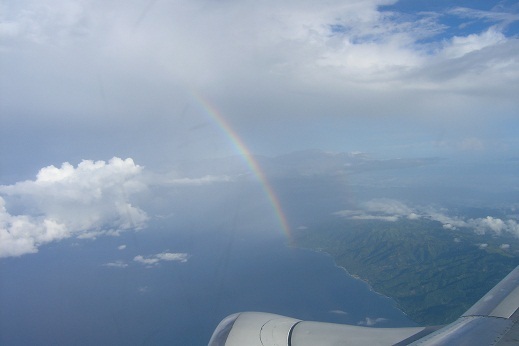 Flights to Gorontalo originate from several cities in Indonesia. These include Jakarta, Denpasar (Bali), Makassar and Manado. Divers planning to board flights to Gorontalo have daily connections. Most flights to Gorontalo start in Jakarta. Several airlines have daily flights to Gorontalo via Makassar (previously known as Ujung Pandang). They are Garuda Indonesia, Batik Air, Sriwijaya Air, Lion Air and now Citilink. Because of frequent flight cancellations, we suggest travelers not to fly Sriwijaya. Divers checking onto a Garuda Indonesia or Citilink flight can ask for the sports equipment waiver on any overweight baggage. Mention that you have alat olahraga diving equipment. provide an extra free 20 kilos for a dive bag containing dive gear on all its flights. Cheap flights from Bangkok, Kuala Lumpur or Singapore arrive in Jakarta. Most flights from Jakarta stop in Makassar for 20 minutes before preceding to Gorontalo. Divers can also choose daily flights to Gorontalo from Denpasar (Bali). Wings Air currently has two daily flights to Gorontalo from Manado. Wings is a subsidiary of Lion Air. Its flight times allow Gorontalo divers to connect with Silk Air from Singapore. Tickets can be purchased on-line from the Lion Air web site. Sometimes their web site refuses credit card payments. In that case, please contact Miguel’s Diving for solutions. Garuda Indonesia has currently suspended this route; please check its website for the latest information. Please contact us for current domestic flight information. One solution for those seeking flights to Gorontalo is the international connection to Manado in North Sulawesi. Silk Air provides routine flights to Manado directly from Singapore. It is a subsidiary of Singapore Airlines. As of late February 2010, Air Asia no longer flies to Manado. Wings Air flies daily from Manado. This allows divers from Singapore to arrive in Gorontalo the same day. The return flight leaves Gorontalo for Manado at 0530 hrs. This allows plenty of time to check-in to a returning flight to Singapore. Please check the Lion Air web site for the current schedule. Garuda Indonesia may also be an alternative. Please check its current schedule. The overland route from Manado takes a full day whether by private transport or by bus. 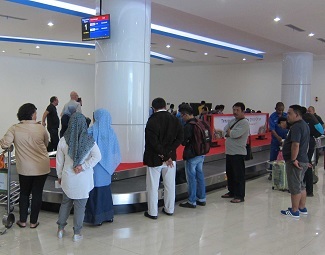 Air Asia connects Kuala Lumpur with the new terminal at Makassar (Ujung Pandang) in South Sulawesi. Batik Air has a new second flight that may allow travelers arriving in Makassar to connect to Gorontalo. Air Asia‘s evening departure back to Kuala Lumpur allows plenty of time for travelers to connect from flights from Gorontalo. See Air Asia’s web site for current information for flight changes as these can change. In 2010, Indonesia revised some of its visa procedures to make things easier. Please check the current requirements and options. Gorontalo’s Djalaluddin Airport now has a new terminal building. Its modern features include sky bridges for travelers arriving by jet. The new baggage claim area is spacious. Also, a smoking area helps keep the facility smoke-free. Divers with reservations with Miguel’s Diving have airport transfers in Gorontalo included in their dive package. Typically, there will be four passengers per vehicle. The ride takes about an hour. Visitors to Gorontalo can experience Sulawesi untouched by mass tourism. This also means that little English is spoken. Bring an Indonesian phrase book. Gorontalo people are genuinely friendly and feel proud that outsiders come to visit their homeland. WIFI is available at your hotel. Cell phone coverage is available, although at times its capacity is overloaded. Indonesian banks will usually only accept new USD100 bills. Banks in Gorontalo do not accept Euro, so we cannot. Travelers heading to Gorontalo should change money prior to arrival in Indonesia or at your arrival airport. Money changers are not readily available outside of airports in Sulawesi. ATMs for cash withdrawals are readily available in Gorontalo. Miguel’s Diving can now accept Visa and MasterCard. There is no surcharge.